CBS News called it one of the biggest courtroom frauds in U.S. history. In an astonishing case of judicial corruption, two Pennsylvania judges were convicted of taking millions of dollars in kickbacks from private juvenile detention facilities in return for sentencing thousands of kids to detention—many of them for absurdly minor offenses, and some of them as young as 11 years old. Pulitzer-prize winning journalist William Ecenbarger covered the story for the Philadelphia Inquirer and has just released a book about the case. 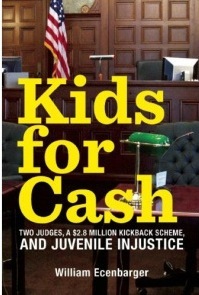 Kids for Cash: Two Judges, a $2.8 Million Kickback Scheme, and Juvenile Injustice raises difficult questions about private prison systems, the corrupting influence of power, and how the justice system can fail us (and even our kids) when left unchecked. We asked Ecenbarger to share a few thoughts on his long career in journalism, how to harness moral outrage as a motivator, and a nifty trick or two from a veteran investigator’s tool kit. How did you find this story, and why did you decide to write a book about it? I got into this story by accident. On the eve of the opening of hearings by a special study commission in October 2009, a staffer in the Philadelphia Inquirer’s Harrisburg bureau became ill, and the newspaper–where I had worked for 25 years—asked if I could fill in the next morning. After listening to a half day of testimony, I knew this was an unusual, almost unbelievable story that called to mind Mark Twain’s dictum that the difference between fiction and the truth is that fiction must be believable. Who discovered that something was wrong with the system? The mother of a 14-year-old girl who was serving 90 days in a juvenile detention center for posting a mock profile of an assistant principal on a social website. How did investigators begin to unravel the threads of corruption and cronyism in the Luzerne Co. courts? The mother contacted the Juvenile Law Center, a nonprofit advocacy group in Philadelphia. The Juvenile Law Center looked into the girl’s case, found more cases, eventually discovered breathtaking patterns of scandal and injustice. The Juvenile Law Center pushed and pushed until it got some action. About this time, the federal government was also looking at the two judges, but not for violating kids’ rights. Rather, they were interested in them for tax evasion and association with organized crime figures. In uncovering stories of corruption like this one, how do you find and follow those threads, when so many of the players are unwilling to be interviewed? Simply by working hard. I was driven by the importance of the story and my outrage over what happened to these kids. The story occupied me for two and a half years. I interviewed more than two hundred people, including forty-three of the judges’ child victims and their parents. I talked to juvenile justice experts, prosecutors, defense lawyers, state officials, federal agents, victims’ advocates. On the local scene in Luzerne County, I met with attorneys, politicians, teachers, and judges. (Ciavarella and Conahan declined to talk to me). I covered hearings, trials, and sentencings, and I read thousands of pages of court documents. What shocked or surprised you the most about this case? Were there emotional moments for you as you interviewed kids who were victimized by the corrupt judges? There was the 11-year-old boy who was hauled into court because his parents couldn’t pay a $488 fine imposed when he got in a dispute with his mother. Because his parents couldn’t pay the fine, Judge Ciavarella had him taken to PA Child Care. In shackles. The boy weighed 63 pounds. By the way, many of the kids told me that the shackling was the worst part of their experience. They felt humiliated. What kind of person, let alone a judge, humiliates a child? There was the 16-year-old girl who reminded me of my daughter at that age. She had an argument with her mother and her sister. She stalked out of the house, saw a cop car, and gave the cop the finger. She was hauled off to PA Child Care, evaluated and then sent to a facility that was 250 miles from her home. She was there for six months. Her parents had to make a 500-mile round trip every weekend to see her for one hour. This girl was on her high school’s honor roll, a Girl Scout, attended weekly Bible school, and worked on the school newspaper. She had no history of discipline problems in school. Clearly, this case incited a certain degree of moral outrage in you, as a human being. But as a professional investigator and storyteller, do you feel the need to step back from that outrage in order to do your work? I think a sense of outrage is an important attribute in a reporter because it is a motivator. But this initial emotional reaction must be tamed and directed toward a calm elucidation of facts that speak for themselves. It’s critical to avoid succumbing to what Tom Wolfe calls “hopey-dopey research”–i.e., investigating with a prejudiced eye toward a particular, not-necessarily accurate conclusion. How do you organize and cull the mountains of facts, interviews, and documents that you gather for a project like this one? It’s like a jigsaw puzzle–only none of the pieces is in the box, and there’s no picture on the boxtop to guide you. The pieces are scattered in hundreds of places, some of them hidden. You have to find them, put them all in the box. This is the hard work. Once you have many of the pieces, you can start putting the puzzle together. This will suggest what the missing pieces are. In your investigative toolbox, do you have a favorite trick for digging up information that you’d care to share? One tiny one comes to mind. Nearly every occupational group (lawyers, dentists, politicians, surveyors–even journalists) has one or more magazines, newsletters, blogs, etc., written expressly for the members of that group. There is usually an assumption that this material won’t be read by anyone outside the group, and so there is a tendency for them to “let their hair down” a bit about how they operate. They can be a rich vein for a journalist willing to wade through them. Do you consider investigative reporting a calling? I’ve always been uncomfortable with the term “investigative reporter” because it seems redundant. All reporters are, or should be, investigators. Charlie had a passion for motors and vehicles, and when he spot­ted a used motorbike for sale in the summer of 2006, he wanted it. It was a bright red Greenline “beach cruiser.” It was only $60. At fifteen, Charlie was a troubled, anxious boy. “We thought it might cheer him up,” his mother recalled, “so we bought it for him. He was overjoyed.” like his father, Charlie had consider­able mechanical aptitude, and he alternately rode and tinkered with his new possession. But several weeks later, two police officers knocked on the door of his house. Charlie was home alone and thought he was in trouble for riding the Greenline without a helmet. Instead, the officer told him the bike was stolen. They said they’d be back later. When Charlie’s parents came home that night, the po­lice returned. The adults tried to explain that they thought they had legitimately purchased the bike, but all three of them were arrested. Later, the charges were dropped against the parents, but Charlie was ordered to appear before (Judge) Ciavarella. Charlie thought he would just explain what happened to the judge, and his problems would be over. Probation officers ad­vised his parents that he did not need an attorney. But as he and his mother sat on folding chairs outside the courtroom awaiting his hearing, his mother noticed a disturbing pattern: Parents were going into Judge Ciavarella’s courtroom with their children, but only the parents were coming out. A low-watt anxiety surged through her. Each time the door opened, his mother heard a jan­gling sound. She didn’t realize it just then, but it was the sound of shackles. Concern turned to panic when they got before the judge and found out Charlie had been charged with receiving stolen merchandise—a felony. Charlie, a shy, pudgy, bespectacled youth, stood there with his hands in his pockets and fear on his face for the entire three-minute hearing. Even though he had had no prior run-ins with law enforcement authorities, Ciavarella adjudicated him a ju­venile delinquent. Charlie was neither advised of his right to a lawyer, told of the consequences of pleading guilty, nor given a chance to explain how he had innocently come to own the mo­torbike. If Charlie had been an adult, he would have received a sentence of either probation or a maximum of one month in prison under state sentencing guidelines. But as a juvenile, Char­lie received an indeterminate sentence. As it turned out, he would be locked up for most of the next three years for a crime he did not commit. (These) cases were not devi­ant, aberrant miscarriages of justice. They were part of a routine and systematic form of child abuse that took place in the juve­nile court of Luzerne County, Pennsylvania, between 2003 and 2008. During that time, several thousand young defendants were needlessly handcuffed, shackled, and summarily dispatched to incarceration that typically lasted between one and three months. After the briefest of hearings, parents who had accompanied their children to court and expected to return home with them, left instead stunned and bewildered, alone. Seldom was Ciavarella’s tough-love justice tempered with mercy. No matter how young the defendants, no matter how clean their records, no matter how cringing their hesitancy, no matter how wobbly-voiced or jelly-kneed they appeared in his courtroom, most left shuffling in their shackles to vans that took them away. While these proceedings were closed to the public, they were witnessed by assistant district attorneys, public defenders, other lawyers, probation officials, and court officers, including clerks and messengers. Often police officers, teachers, and school administrators were also present. The air was heavy with un­spoken words and unacknowledged guilt, yet for six years, through thousands of hearings, no one spoke out effectively in opposition. In failing to do so, public servants, educators, and others charged with protecting our children served as enablers for one of the worst judicial scandals in American history. For as he meted out these injustices, Judge Ciavarella and his behind-the-scenes co-conspirator, Judge Michael T. Conahan, were being paid mil­lions of dollars by the owners of PA Child Care. in exchange, the judges provided the owners a steady stream of inmates. Children became commodities in a kids-for-cash scheme. Excerpted from Kids for Cash, by William Ecenbarger. Copyright © 2012 by William Ecenbarger. Reprinted with the permission of the author.